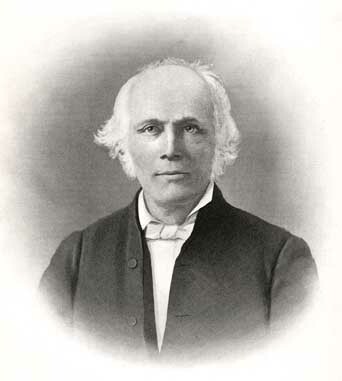 Charles West Starr was born in Philadelphia on February 28, 1792. In 1818 he traveled to the west and first arrived in Richmond, Indiana on January 1, 1819. He was impressed with what he saw and entered a claim in Wayne County near the present town of Economy. He married Elizabeth Wilson in November 1819 and lived back in Philadelphia for a time. In 1825 the couple moved permanently to Richmond, living on Front (now 4th) Street at first. In 1826, Charles purchased Jeremiah Cox's land, all of which was located north of Main Street. He paid $25 per acre for the 222 acres. He laid out streets and divided some of the land into quarter acre lots, which he then sold for $100 each. This area today is known as the Starr Historic District and is listed on the National Register of Historic Places. Charles Starr was a business leader for the rest of his life and was instrumental in the early growth of Richmond. He and Elizabeth had ten children including William, James, and Benjamin.